Strong odor-absorbing capacity and its mild alkalinity helps dissolve fatty acids in dirt. It is completely safe and harmless to the environment. Thanks to these properties, MAX has many applications in animal breeding. Contents: > 30 % sodium bicarbonate (baking soda), < 5 % natural orange oil (contains sweet orange extract, may cause allergic reaction). 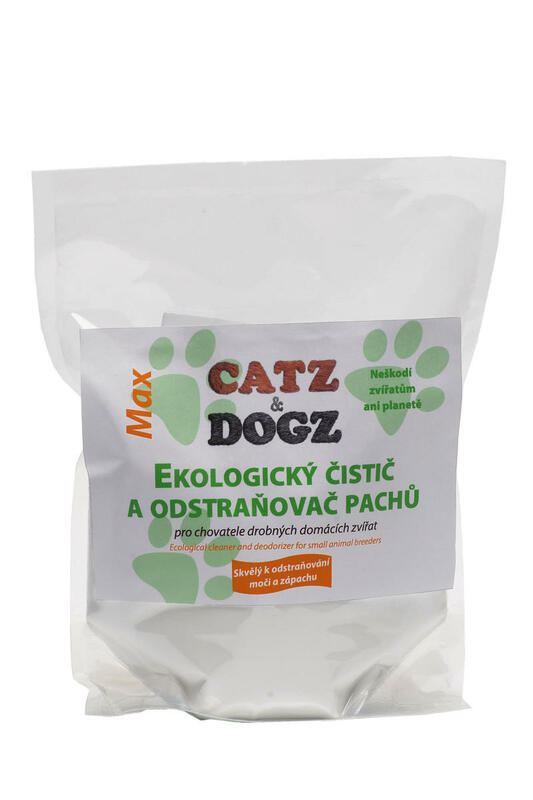 Features: Removes odors from dog and cat bedding, easy absorption and cleanup of pet urine, cleans brushes for animals, cleans greasy animal collars, food and water bowls, prevents odors from cat litter boxes and rodent cages, cleans and deodorizes pet toys, cleans and deodorizes dog beds, “dry shampoo” for dogs, deep cleanses dirty and smelly hands, air freshener for all breeder's equipment ... Detailed instructions are on the enclosed leaflet. Subject * Product inquiry MAX – cleaner and deodorizer for breeders RMA Misc.